As always, I welcome your comments. The article I promised earlier, summarizing the scientific articles below, is coming in the next few hours, as fast as I can write it. First, I believe in a continuum of beliefs on the issue. On the far end of the spectrum is the message of the charlatans like Rokke and Durakovic and Riley, who make it sound like DU is absolutely deadly and an integral part of some global genocidal conspiracy. On the other end of the spectrum is the message of the most adamant DU proponents, who make it sound like DU is utterly harmless to humans, animals, or the environment in all its forms and in all circumstances. I believe that DU's hazards are somewhere in between those two ends. My beliefs are based on the current science related to DU, with which I've been privileged to become somewhat acquainted over the years, including in my roles on a couple governmental research bodies. And, as the science evolves, so undoubtedly will my beliefs. As you may know, there's a growing body of scientific evidence, including a number of DoD-funded studies, which show replicable health effects of DU in various settings, particularly DU that is inhaled or ingested. And, since they're scientists rather than self-serving charlatans, their studies are published in reputable scientific journals for peer review rather than broadcast on talk radio, and that scientific writing rarely makes it into the popular press. DU's hazards are known, as you may know, as a result of its toxicity as a heavy metal. And, there's a good body of scientific evidence that shows that even the relatively low-level radioactive properties of DU can cause damage to cells and DNA in very close proximity to DU, such as in the lungs, implanted DU (i.e. shrapnel), and so on. This seems to imply that a balance has been found between the known hazards of DU particulate matter and the recognized and substantial utility of DU in both protective armaments and offensive weapons. 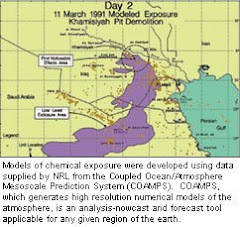 For the Gulf War, some troops (not nearly enough to account for IOM's 250,000 Gulf War veterans with chronic multisymptom illness) were exposed to DU particulate matter suspended in air in equipment (tanks, etc.) and buildings shortly after hit they were hit by DU rounds. Still others (also relatively small numbers) were exposed when entering and re-aeresolizing the DU particulate matter by kicking it up. And, some number of troops (and possibly locals) were exposed to burning DU smoke and particulate matter at the Camp Doha fire, though that particulate matter may have had different physical properties. In case you haven't been tracking the medical and scientific journals, below are a handful of scientific journal citations. I pulled them as I found them to give you a sample and a sense of the findings -- others, including the scientists on the VA Research Advisory Committee on Gulf War Veterans' Illnesses, have done a much better job of reviewing and collating this sort of research. And, if you're already well acquainted with this body of research, please forgive me. Again, the articles below are just a small sample of what's out there. If you're not acquainted (and forgive me again if you are), PubMed is an excellent source for these sorts of journal abstracts. Meanwhile, it appears from follow-on conversations that the battle to prevent Rokke from speaking is still ongoing. I hope Jim Bunker survives the current coup attempt from Rokke's unwitting supporters on the NGWRC board. Gulf War veterans need NGWRC to survive – and remain credible – in order to continue the important advocacy work in Washington, DC and beyond. Int J Environ Res Public Health. 2010 Jan;7(1):303-13. Epub 2010 Jan 25. The toxicity of depleted uranium. Depleted uranium (DU) is an emerging environmental pollutant that is introduced into the environment primarily by military activity. While depleted uranium is less radioactive than natural uranium, it still retains all the chemical toxicity associated with the original element. In large doses the kidney is the target organ for the acute chemical toxicity of this metal, producing potentially lethal tubular necrosis. In contrast, chronic low dose exposure to depleted uranium may not produce a clear and defined set of symptoms. Chronic low-dose, or subacute, exposure to depleted uranium alters the appearance of milestones in developing organisms. Adult animals that were exposed to depleted uranium during development display persistent alterations in behavior, even after cessation of depleted uranium exposure. Adult animals exposed to depleted uranium demonstrate altered behaviors and a variety of alterations to brain chemistry. Despite its reduced level of radioactivity evidence continues to accumulate that depleted uranium, if ingested, may pose a radiologic hazard. The current state of knowledge concerning DU is discussed. Biochimie. 2009 Oct;91(10):1328-30. Epub 2009 Mar 24. DNA methylation during depleted uranium-induced leukemia. Miller AC, Stewart M, Rivas R.
OBJECTIVES: The radioactive heavy metal depleted uranium (DU) is used in kinetic-energy penetrators in military applications. The objective of this study was to determine involvement of DNA methylation in DU-induced leukemia. METHODS: Methylation was measured by direct analysis of 5-methylcytosine content of spleen DNA in DU leukemic mice. RESULTS: Spleen hypomethylation occurred during DU-induced leukemogenesis (chronic internal DU exposure). Aberrant gene transcription was also detected. CONCLUSIONS: Epigenetic mechanisms are implicated in DU-induced leukemia. These data are evidence of aberrant DNA hypomethylation being associated with DU leukemogenesis. Mutat Res. 2010 Mar 29;697(1-2):33-7. Epub 2010 Feb 19. Particulate depleted uranium is cytotoxic and clastogenic to human lung epithelial cells. LaCerte C, Xie H, Aboueissa AM, Wise JP Sr. Wise Laboratory of Environmental and Genetic Toxicology, University of Southern Maine, 96 Falmouth St., PO Box 9300, Portland. Depleted uranium (DU) is commonly used in military applications and consequently exposure to soldiers and non-combatants is potentially frequent and widespread. DU is suspected to be a carcinogen, potentially affecting the bronchial cells of the lung. Few studies have considered DU in human bronchial cells. Accordingly, we determined the cytotoxicity and clastogenicity of particulate DU in human bronchial epithelial cells (BEP2D cells). DU-induced concentration-dependent cytotoxicity in human bronchial epithelial cells, and was not clastogenic after 24h but induced chromosomal aberrations after 48h. These data indicate that if DU is a human bronchial carcinogen, it is likely acting through a mechanism that involves DNA breaks after longer exposures. Copyright 2010 Elsevier B.V. All rights reserved. Toxicol Lett. 2010 Feb 15;192(3):337-48. Epub 2009 Nov 13. Different genotoxic profiles between depleted and enriched uranium. Darolles C, Broggio D, Feugier A, Frelon S, Dublineau I, De Meo M, Petitot F.
Institut de Radioprotection et de Sûreté Nucléaire, Laboratoire de Radiotoxicologie Expérimentale IRSN/DRPH/SRBE/LRTOX, Pierrelatte, France. Uranium is an alpha-particle-emitting heavy metal. Its genotoxicity results from both its chemical and its radiological properties that vary with its isotopic composition (12% enriched uranium in (235)U (EU) has a specific activity 20 times higher than 0.3% depleted uranium in (235)U (DU)). The influence of the isotopic composition of uranium on its genotoxic profile (clastogenic/aneugenic) has never been described. The present study evaluated genotoxic profile of uranium with the cytokinesis-block micronucleus centromere assay. C3H10T1/2 mouse embryo fibroblasts were contaminated with either DU or EU at different concentrations (5 microM, 50 microM and 500 microM). Cells received low doses ranging from 0.3 microGy to 760.5 microGy. The frequency of binucleated cells with one micronucleus increased with increasing concentrations of both DU and EU in the same way. EU induced more centromere-negative micronuclei and nucleoplasmic bridges than DU. A correlation between these two clastogenic markers and ionizing radiation doses was observed. Finally, this study showed that the genotoxic profile of uranium depends on its isotopic composition. DU and EU are low and high clastogens, respectively. However, DU aneugenic effects remain high. Thus, there is a need to study the potential role of aneugenic effects of DU in carcinogenic risk assessment linked to uranium internal exposure. Copyright 2009 Elsevier Ireland Ltd. All rights reserved. J Toxicol Environ Health B Crit Rev. 2009 Aug;12(7):525-39. Toxicity studies on depleted uranium in primary rat cortical neurons and in Caenorhabditis elegans: what have we learned? Depleted uranium (DU) is the major by-product of the uranium enrichment process for its more radioactive isotopes, retaining approximately 60% of its natural radioactivity. Given its properties as a pyrophoric and dense metal, it has been extensively used in armor and ammunitions. 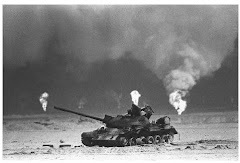 Questions have been raised regarding the possible neurotoxic effects of DU in humans based on follow-up studies in Gulf War veterans, where a decrease in neurocognitive behavior in a small population was noted. Additional studies in rodents indicated that DU readily traverses the blood-brain barrier, accumulates in specific brain regions, and results in increased oxidative stress, altered electrophysiological profiles, and sensorimotor deficits. This review summarizes the toxic potential of DU with emphasis on studies on thiol metabolite levels, high-energy phosphate levels, and isoprostane levels in primary rat cortical neurons. Studies in Caenorhabditis elegans detail the role of metallothioneins, small thiol-rich proteins, in protecting against DU exposure. In addition, recent studies also demonstrate that only one of the two forms, metallothionein-1, is important in the accumulation of uranium in worms. Chem Res Toxicol. 2010 Feb 15;23(2):373-8. Depleted uranium induces neoplastic transformation in human lung epithelial cells. Xie H, LaCerte C, Thompson WD, Wise JP Sr. Wise Laboratory of Environmental and Genetic Toxicology, Maine Center for Toxicology and Environmental Health, Department of Applied Medical Sciences, University of Southern Maine, 96 Falmouth Street, P.O. Box 9300, Portland, Maine 04104-9300, USA. Depleted uranium (DU) is commonly used in military armor and munitions, and thus, exposure of soldiers and noncombatants is frequent and widespread. Previous studies have shown that DU has both chemical and radiological toxicity and that the primary route of exposure of DU to humans is through inhalation and ingestion. However, there is limited research information on the potential carcinogenicity of DU in human bronchial cells. Accordingly, we determined the neoplastic transforming ability of particulate DU to human bronchial epithelial cells (BEP2D). We observed the loss of contact inhibition and anchorage independent growth in cells exposed to DU after 24 h. We also characterized these DU-induced transformed cell lines and found that 40% of the cell lines exhibit alterations in plating efficiency and no significant changes in the cytotoxic response to DU. Cytogenetic analyses showed that 53% of the DU-transformed cell lines possess a hypodiploid phenotype. These data indicate that human bronchial cells are transformed by DU and exhibit significant chromosome instability consistent with a neoplastic phenotype. J Radiat Res (Tokyo). 2009 May;50(3):183-92. Accumulation and distribution of uranium in rats after implantation with depleted uranium fragments. Zhu G, Tan M, Li Y, Xiang X, Hu H, Zhao S.
PURPOSE: The aim of our study was to clarify the accumulation and distribution of uranium in depleted uranium (DU) implanted rats. MATERIALS AND METHODS: Male Sprague-Dawley rats were surgically implanted in gastrocnemius muscle with DU fragments at 3 dose levels (low, medium and high), and biologically inert tantalum (Ta) fragments were used as controls. At 1 day and 7, 30, 90, 180 and 360 days after implantation, the rats were euthanized and tissue samples including serum and urine were collected to analyze the uranium levels by inductively coupled plasma-mass spectrometry (ICP-MS). RESULTS: At all time points, uranium levels in all the DU implanted groups were higher than that in Ta control group, and uranium concentrations in kidney and bone were significantly greater than that in other tissues. Otherwise, uranium concentrations increased with a close correlation to the implanted DU doses and duration of exposure, with a peak at 90 days post-implantation, after which followed by a decreasing period, but still maintained at a relatively high level even at 360 days post- implantation. The uranium concentrations in bone were 6.92 +/- 0.97 microg U/g, 16.35 +/- 1.67 microg U/g and 21.64 +/- 3.68 microg U/g in the low-, medium- and high-dose group animals, while values in kidney tissues were 10.66 +/- 1.10 microg U/g, 14.06 +/- 1.28 microg U/g and 17.79 +/- 2.87 microg U/g, respectively, at 360 days post-implantation. CONCLUSION: It was concluded that kidney and bone are the primary reservoirs for uranium redistributed from intramuscularly embedded fragments, and the accumulations in kidney, bone and many other tissues suggest the potential for unanticipated physiological consequences of chronic exposure to DU. Acute toxicity of subcutaneously administered depleted uranium and the effects of CBMIDA in the simulated wounds of rats. Fukuda S, Ikeda M, Nakamura M, Yan X, Xie Y. We examined the acute toxicity of depleted uranium (DU) after subcutaneous injection as a simulated wound model (experiment I), and the effects of a chelating agent, catechol-3,6-bis(methyleiminodiacetic acid) (CBMIDA), on the removal and damages caused by uranium by local treatment for wounds in rats (experiment II). Experiment I: To examine the initial behavior and toxicity of uranium of different chemical forms, male Wistar rats were subcutaneously injected with 4 and 16 mg kg-1 DU in a solution of pH 1 and 7. The rats were killed 1, 3, 6, and 24 h after DU injection. The DU (pH 1) injection site on the skin was altered markedly by acid burn, and the chemical action of uranium compared with that of DU (pH 7). After the injection of 4 mg kg-1 DU (pH 1), about 60% of the uranium was retained 1-3 h at the injected sites and then decreased to 16% at 24 h. However, the concentration of uranium in the injected site after 16 mg kg-1 DU (pH 1) injection did not change significantly. Urinary excretion rates of uranium (pH 1) increased in a time-independent manner after the injection. Depositions of uranium in the liver, kidneys and femur were found at 1 h after DU injection, and the results of serum and urinary examinations indicated that severe damage in the organs, including the kidney, was induced. The results of the DU (pH 7) were useful for estimating the chemical toxicity of uranium. Experiment II: The effects of CBMIDA by local treatment for wounds with DU were examined. CBMIDA (480 mg kg-1) was infused into the DU-injected site 0, 10, 30, 60, 120 min, and 24 h after the subcutaneous injection of 4 mg kg-1 DU (pH 1 and 7). The uranium at the injected sites decreased to 4-17% of that at 24 h in the DU (pH 1) group without CBMIDA treatment in experiment I, when it was administered within 120 min after DU injection. In addition, CBMIDA had excellent efficacy in excreting the uranium in urine and feces and decreasing the concentrations of uranium in the kidneys and femur. However, there were no distinct effects of CBMIDA for DU (pH 7). In conclusion, the results indicated that the subcutaneous injected uranium acutely induced severe damage in the DU-injected sites and organs by chemical toxicity within a very short time after DU intake, despite the chemical forms of uranium used, and the local treatment of CBMIDA for wounds contaminated with DU was effective in decreasing the acute toxicity of uranium if carried out within 120 min after DU administration. Physicochemical characterization of Capstone depleted uranium aerosols IV: in vitro solubility analysis. As part of the Capstone Depleted Uranium (DU) Aerosol Study, the solubility of selected aerosol samples was measured using an accepted in vitro dissolution test system. This static system was employed along with a SUF (synthetic ultrafiltrate) solvent, which is designed to mimic the physiological chemistry of extracellular fluid. Using sequentially obtained solvent samples, the dissolution behavior over a 46-d test period was evaluated by fitting the measurement data to two- or three-component negative exponential functions. These functions were then compared with Type M and S absorption taken from the International Commission on Radiological Protection Publication 66 Human Respiratory Tract Model. The results indicated that there was a substantial variability in solubility of the aerosols, which in part depended on the type of armor being impacted by the DU penetrator and the particle size fraction being tested. Although some trends were suggested, the variability noted leads to uncertainties in predicting the solubility of other DU-based aerosols. Nevertheless, these data provide a useful experimental basis for modeling the intake-dose relationships for inhaled DU aerosols arising from penetrator impact on armored vehicles. Toxicology. 2009 Apr 5;258(1):1-9. Epub 2008 Dec 31. Different pattern of brain pro-/anti-oxidant activity between depleted and enriched uranium in chronically exposed rats. Lestaevel P, Romero E, Dhieux B, Ben Soussan H, Berradi H, Dublineau I, Voisin P, Gourmelon P.
Uranium is not only a heavy metal but also an alpha particle emitter. The main toxicity of uranium is expected to be due to chemiotoxicity rather than to radiotoxicity. Some studies have demonstrated that uranium induced some neurological disturbances, but without clear explanations. A possible mechanism of this neurotoxicity could be the oxidative stress induced by reactive oxygen species imbalance. The aim of the present study was to determine whether a chronic ingestion of uranium induced anti-oxidative defence mechanisms in the brain of rats. Rats received depleted (DU) or 4% enriched (EU) uranyl nitrate in the drinking water at 2mg(-1)kg(-1)day(-1) for 9 months. Cerebral cortex analyses were made by measuring mRNA and protein levels and enzymatic activities. Lipid peroxidation, an oxidative stress marker, was significantly enhanced after EU exposure, but not after DU. The gene expression or activity of the main antioxidant enzymes, i.e. superoxide dismutase (SOD), catalase (CAT) and glutathione peroxidase (GPx), increased significantly after chronic exposure to DU. On the contrary, oral EU administration induced a decrease of these antioxidant enzymes. The NO-ergic pathway was almost not perturbed by DU or EU exposure. Finally, DU exposure increased significantly the transporters (Divalent-Metal-Transporter1; DMT1), the storage molecule (ferritin) and the ferroxidase enzyme (ceruloplasmin), but not EU. These results illustrate that oxidative stress plays a key role in the mechanism of uranium neurotoxicity. They showed that chronic exposure to DU, but not EU, seems to induce an increase of several antioxidant agents in order to counteract the oxidative stress. Finally, these results demonstrate the importance of the double toxicity, chemical and radiological, of uranium.